At the top of the Bordeaux price scale are the wines of Pomerol, a neighbour of St Emilion on the right bank. Petrus has a legendary quality and, combined with its low production, has historically commanded high prices: the 2013 was released at SFr 18’500 per dozen. 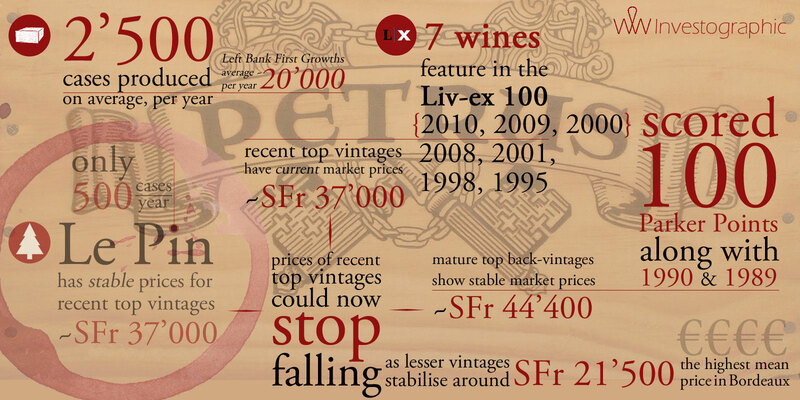 Paradoxically, these wines have displayed relatively stable prices; for example, where the last 10 vintages of Lafite have fallen around 15% on average over the last twelve months, Petrus has fallen only 5%, with some vintages making small gains. 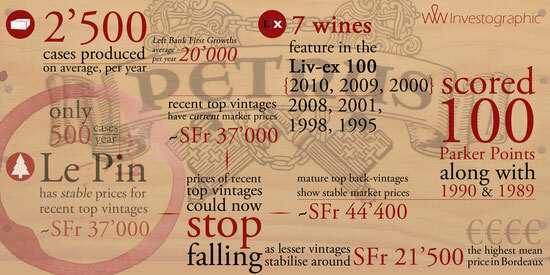 Petrus 2010 and 2009 are on the 100-point list, both with flat investment trajectories of <1% per annum at current prices. The positive here is that these two vintages no longer appear overpriced when compared to the 1990 and 1989, which are now at the start of their drinking window and exhibit stable prices. Moreover, the neighbouring wines from Le Pin also appear to be relatively stable at similar prices, with under 5% variation over the last twelve months. The vintages with point scores between 90 and 95 are all gathered around SFr 21’500, some of which have been there for the last twelve months, and therefore we expect these prices to remain stable under prevailing market conditions. It is likely that a shift towards more positive market sentiment would provide some stability to the 95-99 point vintages, many of which have a diminishing price premium over the ‘lesser’ vintages. The key argument remains that these super-premium wines of Chateau Petrus and Le Pin appear to be holding their market prices way above the rest of Bordeaux, and there are no signs of convergence as we observed in St Emilion’s top tier wines. While it is unlikely that Petrus will imminently make a significant positive performance contribution to the Liv-ex 100, current industry sentiment is that the consumption segment of the market may begin to stabilise these exceptionally high prices.